Manchester City welcome Bristol City to the Etihad Stadium on Tuesday for the first leg of their EFL Cup semi-final. Who will claim the bragging rights? Don't miss our Man City vs Bristol City betting preview with free predictions, betting tips, probable lineups, team news, odds, bookie offers and no deposit bonuses! Manchester City came from behind to beat 4-1 Burnley in the FA Cup on Saturday, remaining on course for an unprecedented quadruple. That victory saw Pep Guardiola's group stretch their domestic unbeaten run to 26 games this season and extend their 14-match winning streak in front of the home crowd. It's over a calendar year since the Citizens last suffered a defeat at Etihad Stadium. Anyway, they reached this stage only after advancing in the previous two rounds with penalty shoot-outs against Wolves and Leicester. Pep Guardiola is expected to do without injured players Gabriel Jesus, Phil Foden, Benjamin Mendy and Vincent Kompany, while David Silva may be absent once again due to personal reasons. The Spaniard could be replaced by Ilkay Gundogan, while Fernandinho and Kevin De Bruyne will retain their starting berth. Sergio Aguero appeared to pick up a knee problem last time out but is expected to recover in time to feature here, with Leroy Sanè and Raheem Sterling on his flanks. Goalkeeper Claudio Bravo should start between the posts, in place of Ederson. Fringe players such as Alexander Zinchenko, Brahim Diaz and Tosin Adarabioyo could all play at some stage. Bristol City knocked out four Premier League clubs to reach the last four, overcoming Manchester United 2-1 at Ashton Gate with Joe Bryan opening the scoring before Korey Smith cancelled out Zlatan Ibrahimovic's equaliser. The Robins warmed up for the occasion with a thumping 3-0 reverse at Watford, their third successive defeat, as boss Lee Johnson fielded a much-changed side. Prior to that, they have suffered losses to Wolverhampton (1-2) and Aston Villa (5-0) in late December and early January. Bristol City are the third highest scorers away from home in the Championship and have scored at least two goals in every round of the EFL Cup. Lee Johnson is likely to field a very similar starting XI that knocked out Manchester UTD in the previous round, having decided to rest his senior players for the FA Cup tie against Watford. Jamie Paterson will support Bobby Reid upfront in a 4-4-1-1 system, with Marlon Pack, Korey Smith, Josh Brownhill and Joe Bryan likely starters in midfield. The likes of Bailey Wright, Aden Flint, Nathan Baker and Hordur Magnusson should form the four man backline. Famara Diedhiou, Gary O'Neil, Eros Pisano, Jens Hegeler, Ivan Lucic and Callum O’Dowda are all on the sidelines. 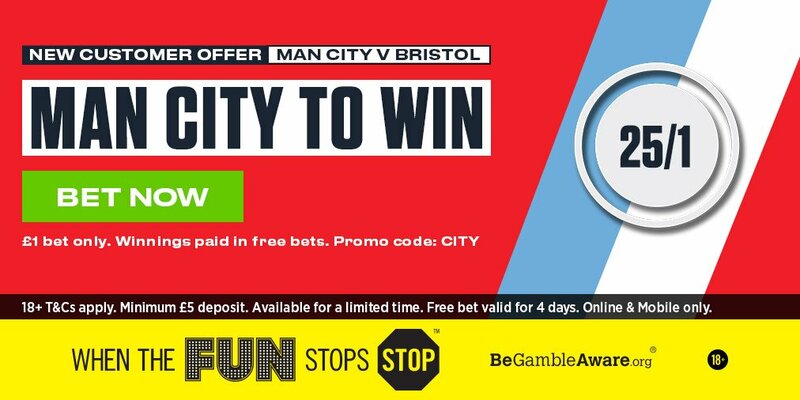 "Manchester City vs Bristol City predictions, betting tips, lineups and free bets (EFL Cup semifinal - 9.1.2018)"
Free £40 Bet if your first bet doesn't win! £40 First Bet Insurance: New customers only. Qualifying period ends 23:59 GMT on 31/12/19. A qualifying bet is a losing first settled real money single bet of at least £/€10 or more (at odds of evens (2.0) or greater (or a multiple where each selection is at odds of 2/5 (1.4) or more. Only losing win single part of an E/W bet will qualify. Free bet equal to your qualifying stake(Max £/€40) will be credited within 24 hours of qualifying bet settling and must be used within 14 days. Free bet stake not included in returns.